Third Annual ROCK & ROLL HALL OF FAME Induction Dinner 20 January 1988, New York City, Waldorf Astoria Hotel. These programmes were only available as a give away at the $1000 per ticket dinner/induction ceremonies. 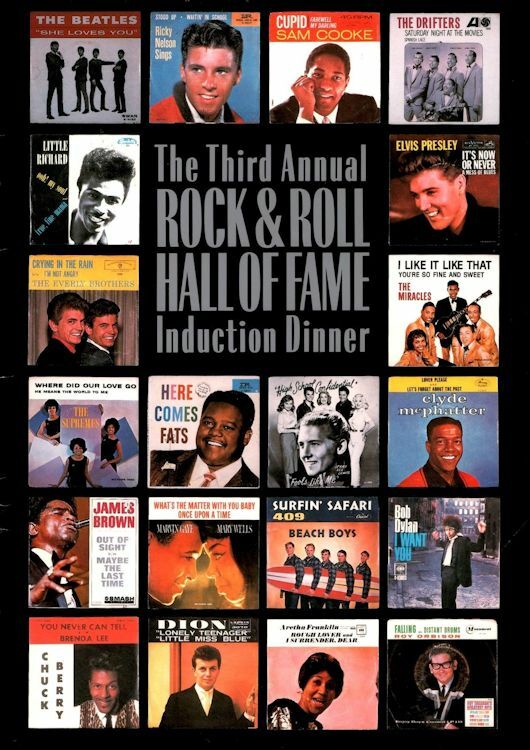 Inducted that night were The Beatles, Bob Dylan, The Beach Boys, The Drifters, The Supremes, Berry Gordy Jr. and as early influences Les Paul, Woody Guthrie, and Lead Belly. The program is filled with photos, biographies, and text about the various inductees.